This post comes to you fresh off me wiping the dust out of my hair, the paint off the random places of my body and my cabinets finally being rehung after what feels like a lifetime forever kitchen cabinet painting. Let me start this post of by telling you I am a kitchen cabinet painting ninja. And if you are not a kitchen cabinet painting ninja then abandon and abort the thought of painting your kitchen right now. If you are still here I say hello my fellow ninja warrior. I moved into this house a few months ago knowing that these cabinets could not stay as they were. And in my over ambitious thinking, leading up to the move, I thought it could be done in the few days between us getting our keys and us pulling that truck with all our stuff and kids up into the driveway. Hubby side eyed me. And because there were more pressing issues to be dealt with pre move-in, AKA popcorn ceilings, it didn't align that I could attempt to do it in those days. The way my life is set up I spent five weeks painting kitchen cabinets. Five weeks! Not five weeks consistently. But five weeks nonetheless. What I will tell you is that as I sit here and look at these beauties, it was every bit worth it. I'd love to share with you the ugly before pictures of just how bad it was. But a funny thing happened. When I moved into the new house my phone didn't work in it. Didn't work, like people sounded like they were under water. I don’t have a house phone. I almost threw the phone. I went and got a new phone. What does this have to do with the pictures you ask? The pictures were on the phone!!! I am taking it as a sign that the universe doesn't want me to share that old kitchen when it has afforded me a beautiful new one thanks to some hard work and some great paint. Thank you Sherwin Williams for good quality paint and primer and a color I can't stop swooning over. Oh yea, this post is a partnership with Sherwin Williams. In it I share my experience with using their product honestly and openly. The fact that I was given product has no bearing on my opinion of the product. So you'll have to settle for these couple pics I have of my kitchen from recently and try to envision just how bad it was. But what I want you to focus on more so is the beauty that is my kitchen cabinets now. Have a look see…. While my kitchen is nowhere near the completed vision I have for it, I am one step closer. And this, my friends is a VERY BIG step. I outlined the prep process and the products that I used last week, but here is the good stuff. The answers to your questions. The important details. The stuff you really want to know. Yes! And if you want your paint to go on nicely I suggest that you do too! For some reason, people, whether painting walls or cabinets, want to skip this step. My advice to you – DO NOT SKIP THIS STEP! 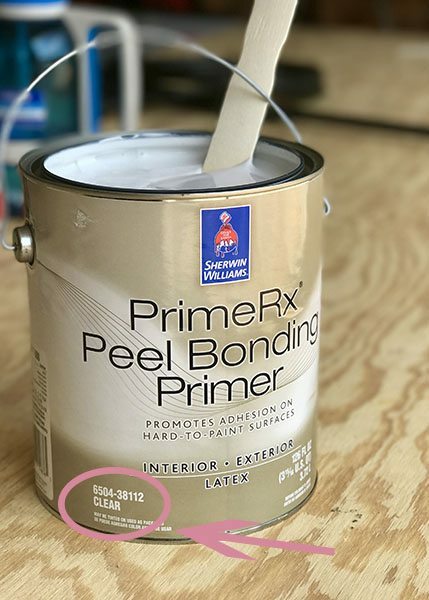 I used Sherwin Williams Prime RX Peel Bonding Primer. 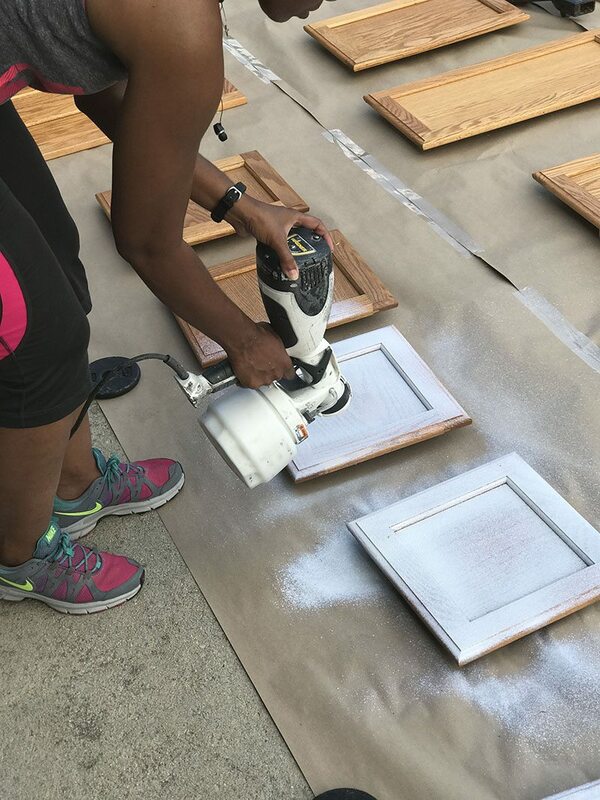 It is recommended to help you save time from sanding and scraping, which I felt was critical for the cabinets. Again, I do not recommend that you skip any steps and I did not skip that step. 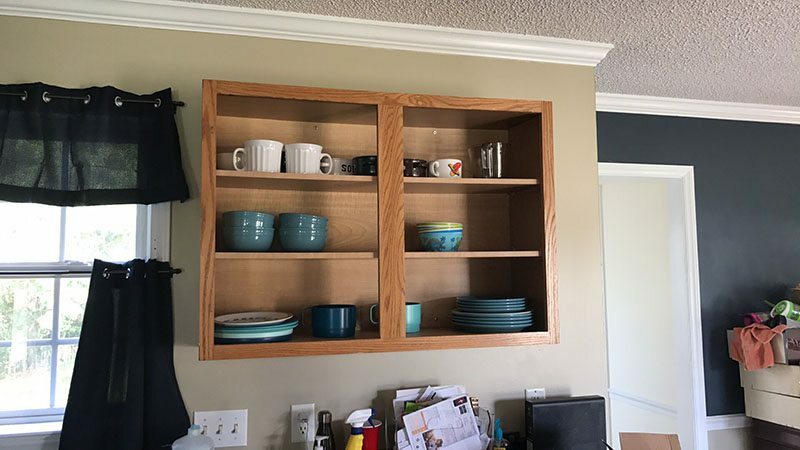 But I felt this was good for the cabinets because no matter how well you sand or strip your cabinets there will be imperfect spaces, and this helps bridge that gap. We sprayed it on and it was seemingly disappearing. I was like “man what have I done?? this stuff is gonna take forever to cover.” I ended up needing more and ran to my local Sherwin Williams store, (Sherwin Williams Emerald Interior Acrylic Latex ) and discovered the can said clear when I went to pick it up off the shelf. Duh Kenya, Duh!!! After that little mixup, it was smooth sailing on priming. I have just saved you that bit of time. You are welcome! I went with Sherwin Williams Emerald Interior Acrylic Latex line of paint. 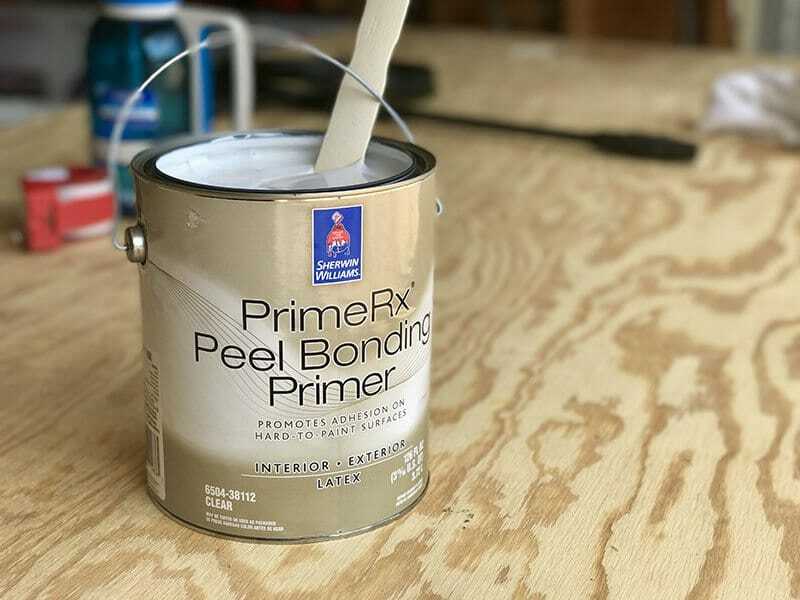 I felt it to be exactly what I needed with the combination of paint and primer and the stain blocking technology. Yes, I already primed, but I also know that cabinets can experience a lot of wear and tear. I have three kids. Three kids who like to eat. Three kids who are always in my darn kitchen. I felt it my responsibility to protect my beloved cabinets from my greedy kids. That is the reason I went with this paint. I have heard of others using a different brand that they thought to be cheaper only to spend more money trying to get the coverage they desired. Don't do it! Choose the right kind. In my opinion, this is the right kind. To ensure a beautiful, smooth finish and stunning color for years to come, use our finest paint ever. 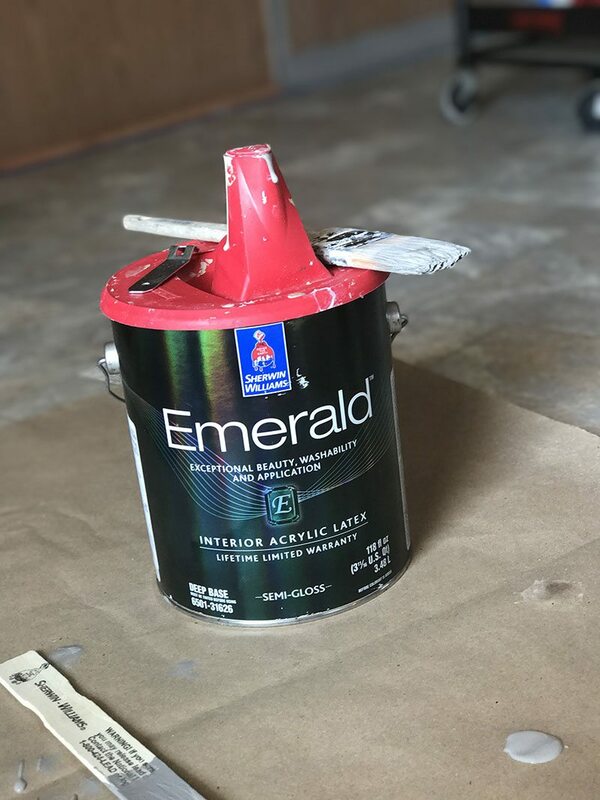 Emerald prevents stains from penetrating, offers maximum resistance to water streaking and spotting, features truly remarkable hide and covers dark colors. With exceptional coverage and washability, it’s perfect for any room in your home. This product contains agents which inhibit the growth of mold and mildew on the surface of this paint film. To me, this says I will work in your kitchen! I will stand up to your kids and their mess! I have your back! I needed my paint to have my back y’all! Could I do this as a weekend project? No. No, you can't. Not unless you only have four cabinets and even then you are pushing it. I consider myself a ninja because I made it all the way through and lived to tell about it today. Might I add with all my children alive and my marriage intact. (Thanks babe. You are the best!) You would have to be a genie. Cause genies are purely magical and that's what it would take. Ninja’s are tough! They fight the good fight, but we don’t have magical powers, like being able to paint kitchen cabinets in a weekend. There are steps and time between the steps. While I probably could have squeezed the prep work into a day, or three. I decided from the beginning to pace myself so I wouldn't get overwhelmed. So each prep step I did over the course of a weekend. But once you start priming and painting you have to allow for this thing called drying time. Drying time drove me crazy! If you want your finished product to be all that you dreamed of. You have to allow for proper drying time. And then once the last coat went on, we still had to wait a few days to hang them so that they could start to cure. I didn’t. There is more than one way to skin a cat (but I’ve never skinned a cat for the record). I opted for the other option – to strip them instead. To me, this was easier. I choose to use a sprayable stripper, and it made that part one of the easiest parts to me. How did you organize them? As we took them down we numbered them inside where the hinges go. Before we started painting we covered that part with painters tape to ensure we could see the numbers when we were done. This was actually the Mr’s genius idea. I swear that dude makes me better. How many coats did you have to do? Thanks to the great coverage of the Sherwin Williams Emerald paint we only needed two coats of paint with minor touch ups in some spots close to where the grooves of the cabinet trim meet. Did you use a top coat? Yes, and if you are gonna take the time to train on becoming a kitchen cabinet painting ninja, don't let it be in vain by not protecting it. 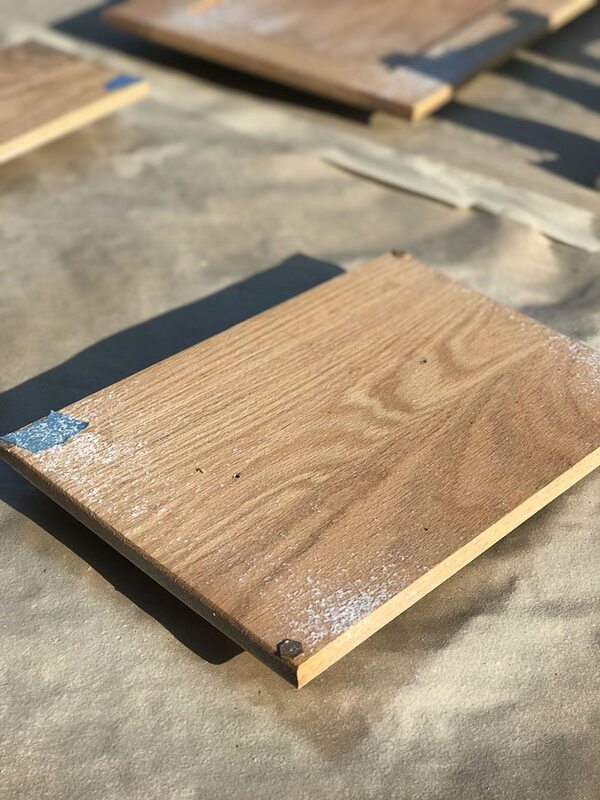 Be sure to use a coat of polyurethane to go over the paint and help prevent it from chipping. 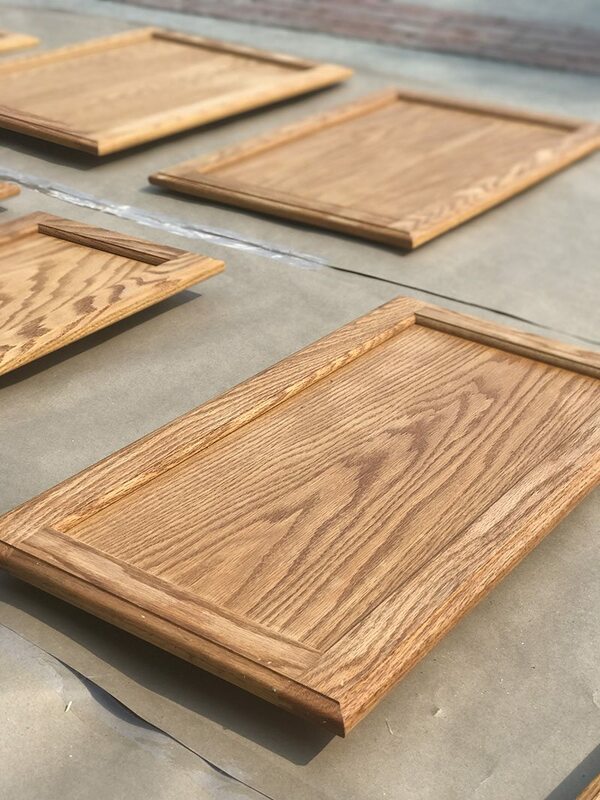 We topped the cabinets with a water-based polyurethane for a protective finish. After doing our research, we determined that this was the best option for us. It is water based, and has a satin finish. I had read where people who opted to use oil based had issues with it yellowing their paint. Do your research my friends! DO. YOUR. RESEARCH. Did you hand paint the cabinets? Hubby did the first coat on the first side by hand. And it was tedious. We started using the sprayer on the back side first coat and going over it with the brush where needed. We did that through the second coat and it saved on time and made them look more flawless. Honest answer today no! Why would I if I got it done right the first time? If for some reason I moved out of this house, which I have no plans to do, then I might do it again. Strong emphasis on might. Painting kitchen cabinets is a very reasonable and cost-effective alternative to buying all new cabinets. I honestly love the cabinets. They're good cabinets. It would have been a complete waste to chuck the deuces to them. I would not do it again for fun. It was not fun. Let me be clear. I love to DIY. Projects are fun to me. This WAS. NOT. FUN! This was a complete labor of love. 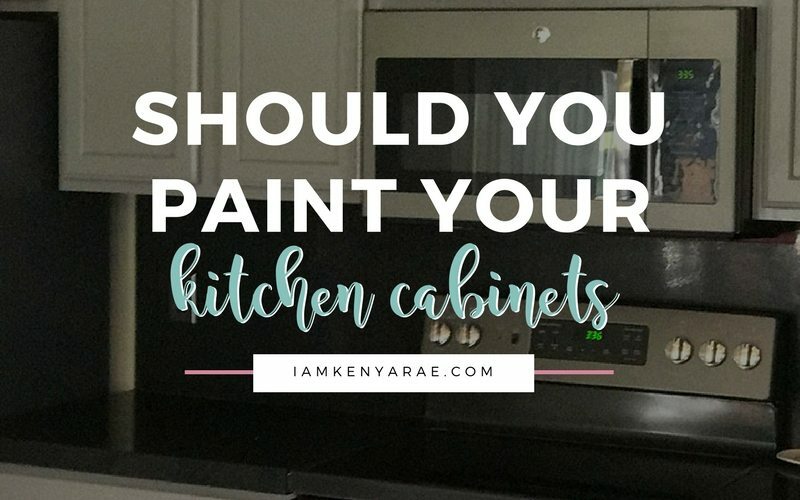 Kenya, should I paint my cabinets? Absolutely, if, and read all of this. 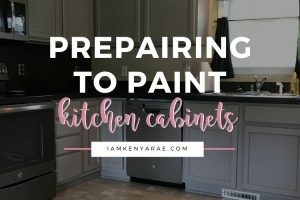 You should paint your cabinets only if you have patience (or have someone that can help you demonstrate patience), are willing to do the research and figure out what works for you and your cabinets (which hopefully is mostly answered between this post and my prep post), have cabinets that are in good shape that you want to get some more years out of. If you can check off all of these things. You should totally paint your cabinets. Did the cabinets turn your kitchen into your dream kitchen? Almost. I have a few more things that need to be done. The floors will be redone. We will add a backsplash. And I have some additional accents I will be adding to the cabinets. And then organizing. My most favorite part! I'm working on organizing them now. I use Dovetail from Sherwin Williams. It is in the gray family. And gray is my family. If gray is your family, you will LOVE IT! So that's it, in a nutshell. Well more like a coconut shell cause this is a lot. This is big. Yea, coconut shell. But I wanted you to feel informed. 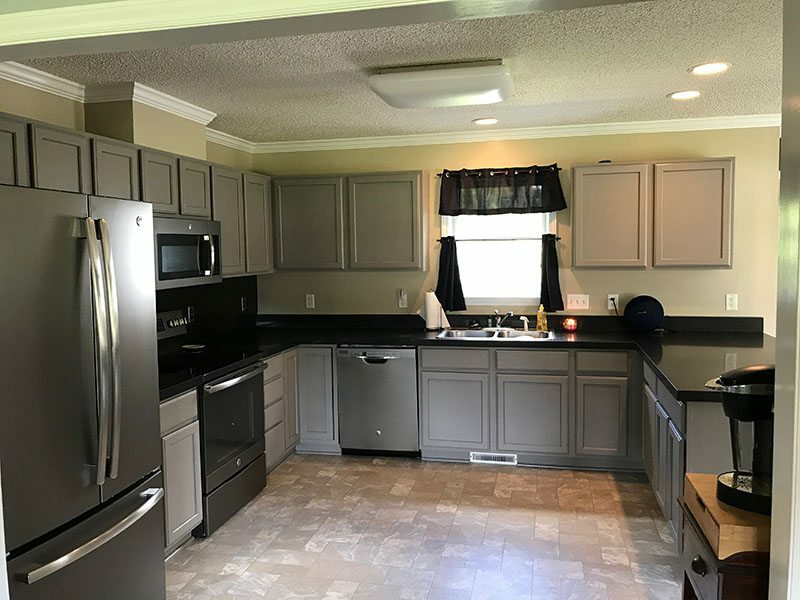 Do you have questions about painting kitchen cabinets that you did not find the answer to here? Drop me a line below and I will tell you what I know! Feeling like you could do it and wanna reference this post for later? Pin it! Know a friend that might need to read this? Share it below! Such great information! You made me feel like a paint ninja. I’m planning to check for this paint in my area as my daughter wants to paint her room. I’ve already sent the post to her so she can do her research. Girrrrll you did an awesome job!! We need to keep our fingers grossed that you and Hubby get a DIY/Renovate TV show!! You got me thinking that I might could possible do that…LOL Great job, you should be so pleased. The kitchen looks amazing. I have to be honest this was my first time using Sherwin William’s paint. The price always scared me. But after doing my research I thought it to be best for it to last. I believe you get what you pay for and so I wanted to ensure that I was satisfied. I DID NOT want to put in all this work and then it not hold up. I have used others. 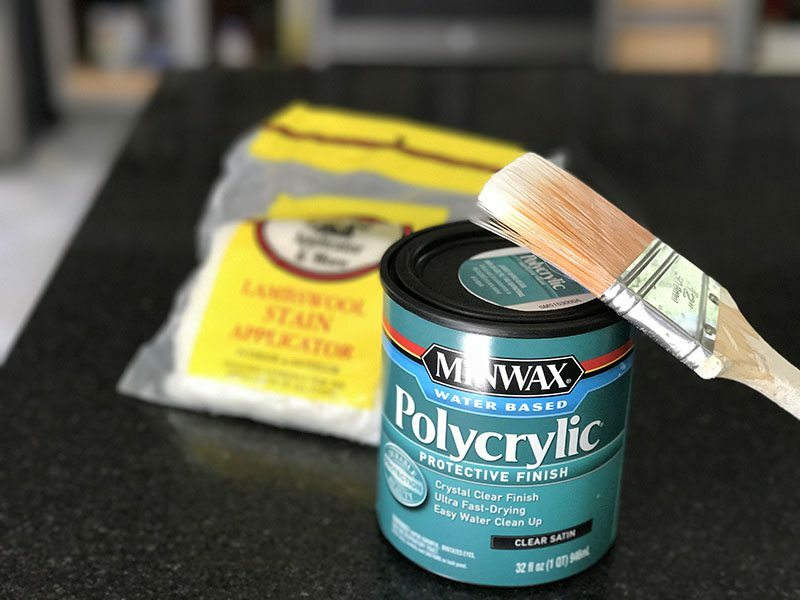 When my kitchen was painted in my last home, the paint did chip in high usage spots (near handles and such) that is why I went wit this type of primer, AND chose to use the polyurethane as my final top coat! I will do an update in a couple months to a year, but I have to say I feel confident with my decision. I researched for months before doing this. I can’t wait to see what you do Tomiko! I know it will be awesome! This was so informative and easy to follow. The gray tone looks gorgeous. When we moved I repainted the ones in the bathroom and added hardware for a finished look. I like how your project turned out. 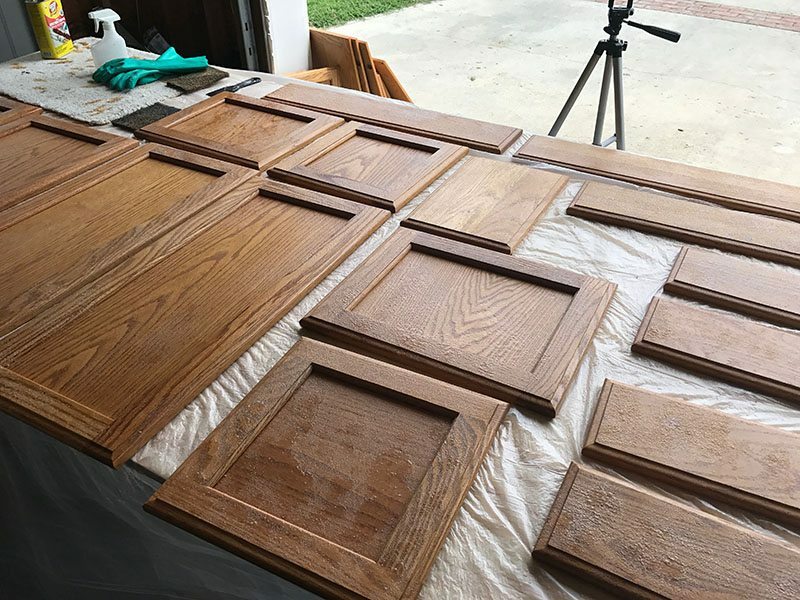 I painted our cabinets after seeing a picture in House Beautiful. I used Benjamin Moore in a greenish color in a pearl finish. It was gorgeous and made all the difference in the world. 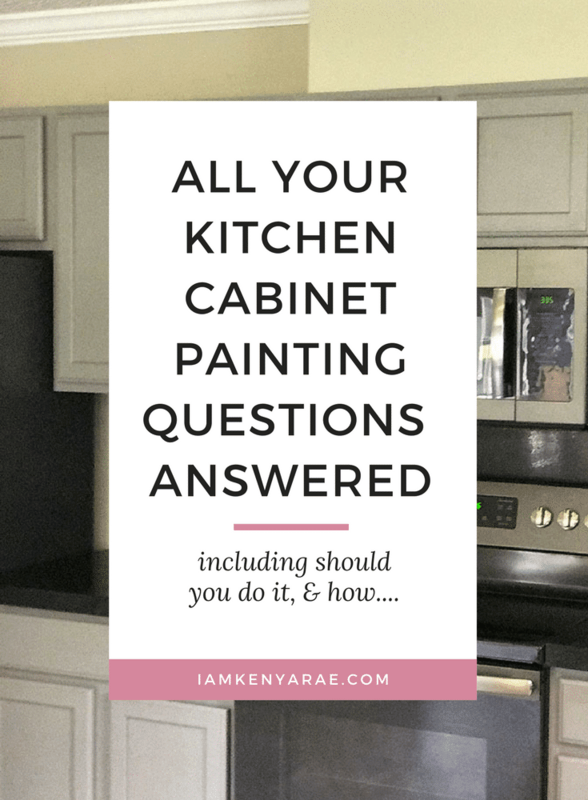 Yes, cabinet painting can change a whole room! I love your style of writing- like we’re sitting down talking about it over coffee- it’s awesome! You def pulled out your ninja skills cause your cabinets are stunning! I appreciate that! Cause that is what I always want it to feel like. And that reminds me I need to go get my cup of coffee. Silly me! Happy Dunday Barb! You did a great job. They look fabulous. My question is. You made reference to not sanding. Unless I missed it did you do something else. My cabinets have a lot of grease on them from the previous owner. What would you suggest I do? Thanks Bev! I had the same problem. I did not sand but I did clean them using goof off spray to get all the grease and grime off. That stuff works wonders! Our daughter’s home was built in the 60’s. They look like pressed wood with some type of plastic covering. I don’t know for sure about the covering just guessing. Problem – smell. They have a musty smell. What do we do with that? Will painting inside cabinets help? Hey Marti! Thank you for stopping by. While I have never had to deal with that, I did find this article that may be helpful.